It is not surprising that many college-aged students, particularly at Penn, care about social impact – the act of creating positive change for people who face social challenges. IMPACT Magazine is just one example of a student group that seeks to inspire other students to make a difference in society. And yet in recent years, this mindset has not been unique to college students alone. Analysis of the Millennial generation (people born between the early 1980s and the early 2000s) has shown that their actions, guided by their focus on social impact, have drastically changed the scope of investment, advertising and manufacturing in companies across the globe. The desire for Millennials to see how their money is making a difference shows in the way they value money differently compared to other generations. Sarah Landrum, a digital marketing specialist and Forbes contributor, states that “millennials might just be the first generation to take the phrase ‘money doesn’t buy happiness’ seriously. That they prioritize ‘making a difference’ over a cushier paycheck is proof enough of that.” She goes on to say that Millennials are often happier at work when they know their money is being used for something wholesome. As a result, social impact investing– a term used to describe money given to companies which seek primarily to make some kind of social change– has been growing as more Millennials enter the workforce. In particular, investment in environmental, social and governance groups – also referred to as “ESG investing” – has seen considerable growth in the last few years as millennials gain more monetary control. It is estimated that $30 trillion will be passed along from the Baby Boomer generation to Millennials. In 2013, JP Morgan predicted that due to millennials, social impact investing would increase from $9 Million to $1 Trillion by 2020. A more recent report by the Global Impact Investing Network (GIIN) says that while impact investing in 2015 was approximately worth $77.4 billion, investment was expected to increase 16% in 2016. [GIIN’s 2017 Report with data from 2016 and predictions for 2017 has not been released yet]. 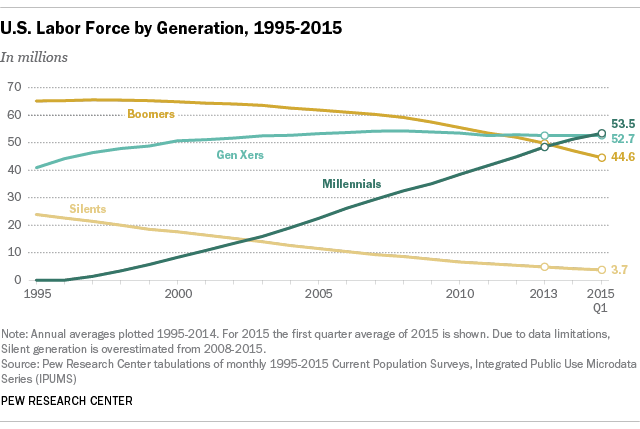 In 2015, Millennials surpassed Generation X as the largest share of the American workforce, as shown by the graph below. This shift in demographics puts Millennials in the drivers seat. Furthermore, they are expected to spend $200 billion annually – giving them a buying power greater than the other generations. Companies in tune to the mindset of their customer base have changed their marketing strategy in response to the greater power Millennials now have. They take extra care to show Millennials how the cash from their purchase will also make a social impact elsewhere. Information about how companies help the community has transitioned from an occasional mention in an advertising strategy to nearly the most important way to attract customers. A great example of this is TOMS, a popular shoe brand that donates one pair of shoes to a child in need for every pair purchased by the customer. Nicole Stavola from thepitagroup.com shared in her blog, “As a Millennial, I can attest to this [phenomena that Millennials are willing to pay more for a product connected to a cause in some way] – I have bought multiple pairs of TOMS shoes at a premium price … If this wasn’t TOMS’ policy, I would think twice before buying them.” This is the kind of sentiment that many Millennials seem to share, and that companies are responding to. As Millennials are changing the way companies advertise, they are also effecting business to business interactions. Larry Myler, the Founder and CEO of the consulting firm By Monday, writes that the spending behavior of millennials has not only changed the way businesses sell to consumers, but has also impacted how businesses sell to one another. A great example of the latter change is that millennial purchasing habits are affecting where manufacturers are buying their raw materials from. In effect, Millennials are also changing the structure of the manufacturing process for many companies. Looking towards the future, Millennials are looking more favorably at the potential businesses have to be agents of positive change. 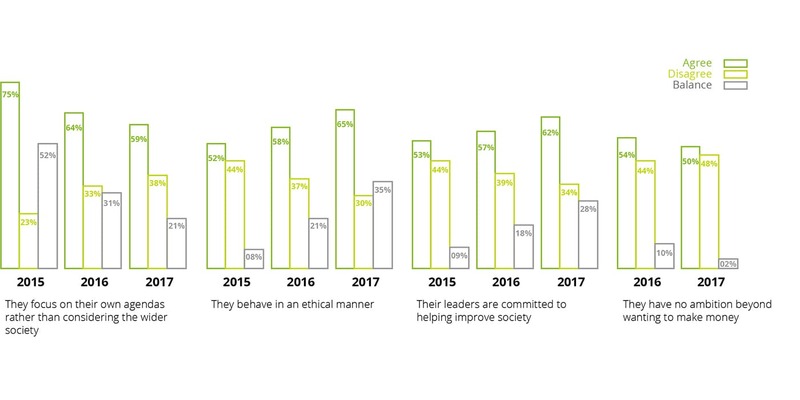 The Deloitte Millennial Survey 2017 shows that over the last three years, criticism of businesses by millennials has decreased. That said, the same report stated that millennials can still be skeptical when considering the motivations of large businesses that advertise their social initiatives. The firm went on to explain that a potential fix for this perception could be integrating more millennials directly within the organizations. This suggestion seems very likely since many Millennials are already in the workforce, and the younger members of the generation are soon to enter it. Millennials have historically received plenty of criticism. They have been blamed for spending more than they earn then sticking their parents with the bill while also being labeled “The Cheapest Generation” (in 2012 alone). There has been plenty debate on the internet about whether this generation is entitled or simply doing the best they can with what they have. And yet, many seem to agree with one label to give millennials: “The Giving Generation”. It seems that in the future, Millennials will be known as the ones who emphasized social impact over anything else. They use it to drive their decisions about consumption of goods and investment in groups. As a result, many aspects of business have changed whether it be investment, advertising strategy or manufacturing operations. Despite the criticism Millennials get, they are also armed with an immense amount of power to do good things in the world. They should know just how much power they have to change the world they live in and make the most of it.